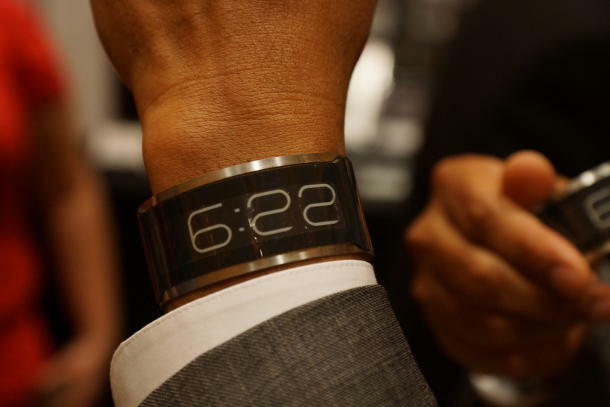 The fight to build the world's thinnest watch has finally been won folks. At least for now. Central Standard Timing has partnered with E-ink to create the CST-01; purportedly the world's thinnest watch. At 0.80mm the watch is thinner than a credit card. I briefly got a chance to hold the extremely light watch and it is indeed the thinnest I've ever seen. According to Central Standard Timing, the patent-pending CST-01 is assembled by laminating thin, flexible components into a 0.5mm pocket etched into a single piece of flexible stainless steel. This is purportedly different than traditional digital watches which typically use the same form factor of an analog watch. The CST-01 also uses an embedded Thinergy Micro-Energy Cell that charges in 10 minutes from an external dock and has a lifetime of 15 years. All CST-01 watches are planned to be assembled in the USA. The CST-01 is available on Kickstarter. Pre-orders start at $129 and the device is expected to ship in quarter 2 of this year.